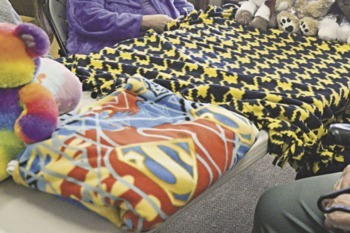 In January, a group of women living at a care center started meeting to create blankets for children living in foster care. Known as the “Knotty Ladies,” the group consists of Rose Ritter, Linda McKinley, Norma Perrine and Rose Carter; all of whom want to help young people in need of support. "A nurse who works here has a friend who works in the court system placing children in foster care," said Pam Schultz, the care center's activity director. "Sometimes the children are taken from their homes with nothing. It's so scary for them." Foster care and adoption is extremely rewarding, if you are interested, please contact Triad Family Services. "Knotty by nature: Ladies' blankets created for children in foster care"
Karnataka Secondary Education Examination Board (KSEEB) conducts the Class 10 board exams every year for the students of Class 10 in the state. This year, SSLC Result Karnataka most probably release on first week of May. Knotty Ladies Create Blankets for Foster Care Children is a creative blog by all means and all the readers who are working for this term papers custom concept will like it. I will try to share this blog on social media. Oh my God, these ladies here are doing a very good job, like i am pretty glad in reading how nice and helpful the are, like i ould do a whole ca.edubirdie.com essay on them as well, that would be pretty amazing for them t be in it !